For you to add the leading "234", you will have to use =TEXT(B2,"23400000000") as the formula instead of the =TEXT(B2,"00000000000") formula used in the tutorial. NB: You must change B2 to that of the first cell in your spreadsheet. 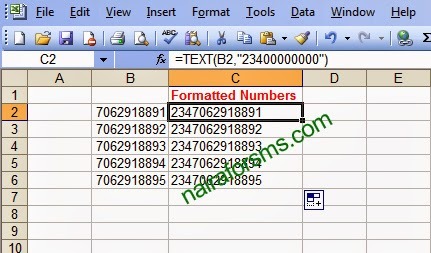 Below is a screenshot of formatted numbers with the leading "234".